Guru Nanak Dev (October 20, 1469 – September 7, 1539) was the founder of Sikhism, and the first of the ten Sikh Gurus. There are ten Gurus who are important to Sikhs. The last Guru said that there would be no more Gurus after him and Sikhs would be taught by the Sikh holy book, which is called Guru Granth Sahib. The word Guru means religious teacher. Beside followers of Sikhism, Guru Nanak Dev is considered holy by Punjabi Hindus and Sahajdhari Sindhis across the Indian subcontinent. Because of his close connection with Hazrat Sheikh Farid-ud-din Ganj Shakar, the Punjabi Sufi saint, Nanak Dev is also considered by many Muslims to be a Sufi, or adherent of Sufic tenets. His main teaching to the world was written down to be "devotion of thought and having good actions as the first of our jobs". 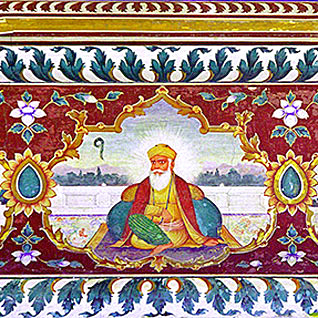 Guru Nanak was born in Nankana Sahib, in Punjab. This is now part of Pakistan. 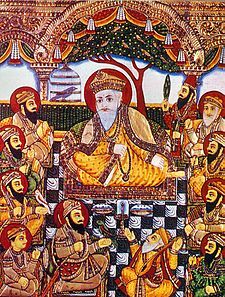 When Guru Nanak was a child he refused the upanayana (holy thread) to initiate him into the Hindu religion. Later in his life he married Mata Sulakhani with whom he had two sons. They were called Sri Chand and Lakshmi Das. According to the Sikh religion, one day he was bathing in the river and god took him up to heaven. His family members were very worried as they had thought he died. After three days he returned with the message of god. He gave up his job to spread the message on how to be a good person. Guru Nanak Dev Facts for Kids. Kiddle Encyclopedia.